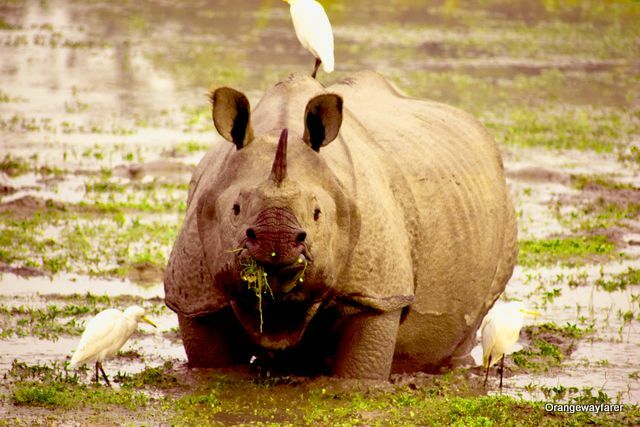 About this blog: Kaziranga National Park in India houses 70% of one-horned rhino population of the world. Located by the southern bank of Brahmaputra river in Assam, Kaziranga forest is also a tiger reserve with more than 100 big cats at their highest density existence. 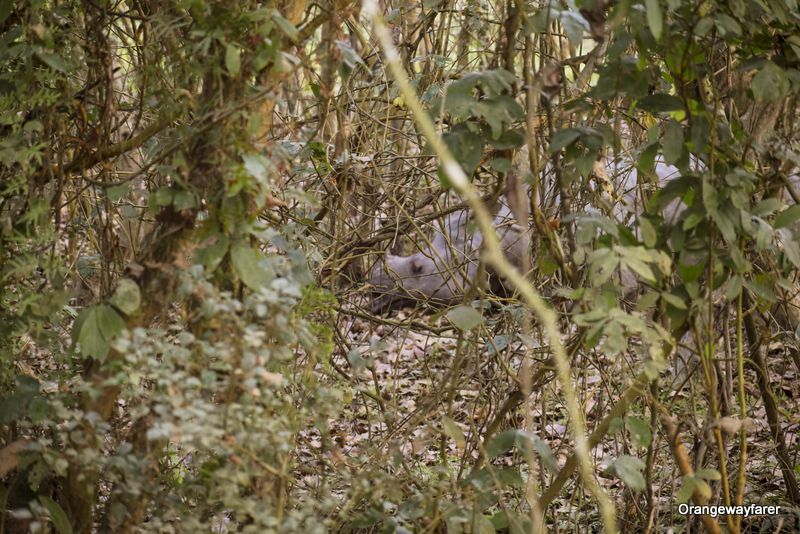 A flimsy number of 18 rhinos slowly but steadily grew somewhere close to 2000 in the park under watchful surveillance of forest guards in the last two decades. 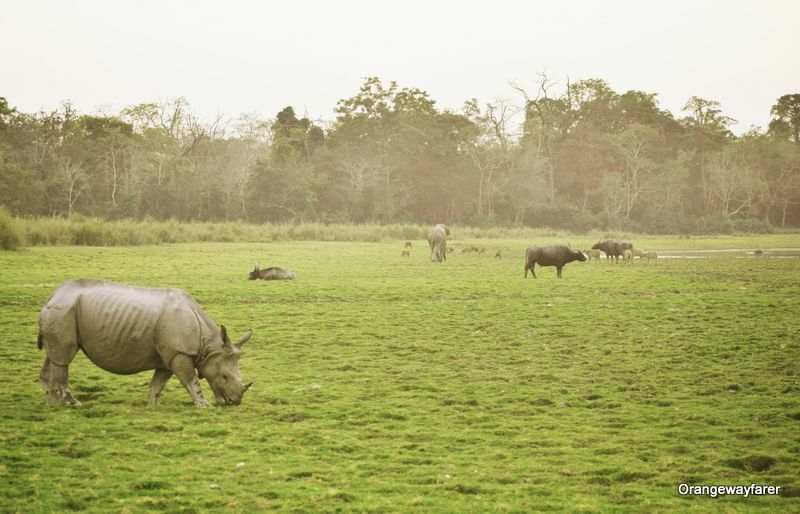 Rightly conferred as a World UNESCO Heritage Site, Kaziranga National Park shares its biodiverse land with myriad kinds of flora and fauna, many of them are endangered or threatened. 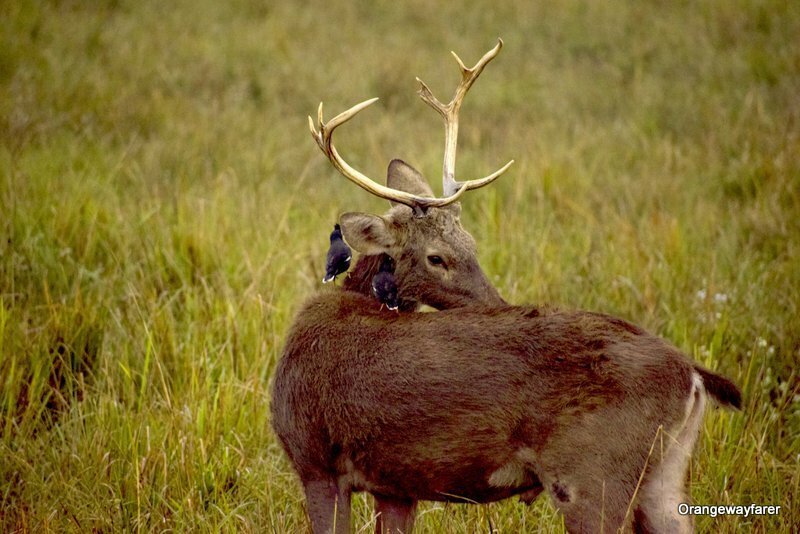 Barashinga, hog deer, otters, tent turtle, Wild Asiatic Buffalos, Migratory and near threatened birds species, elephants are to name a few of the residents. 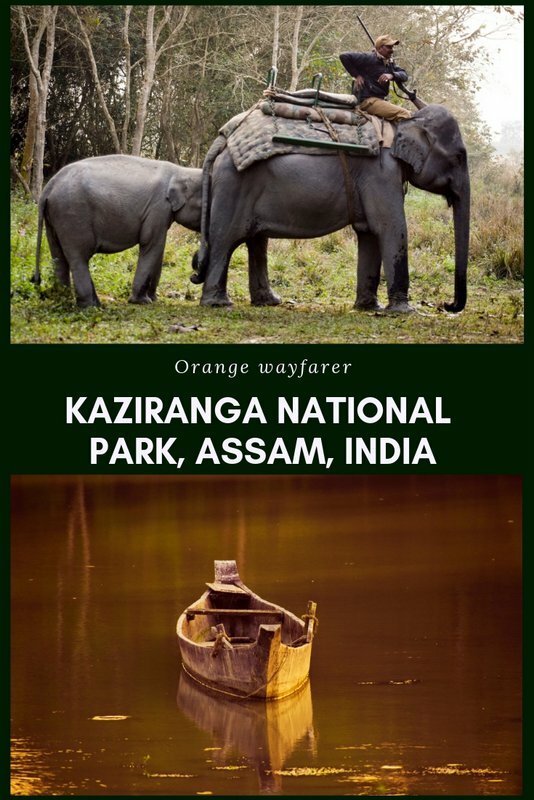 In case you are planning a trip to Kaziranga and are on the lookout of practical travel tips for a couple of days safari at Kaziranga, this Kaziranga travel blog is your friend! 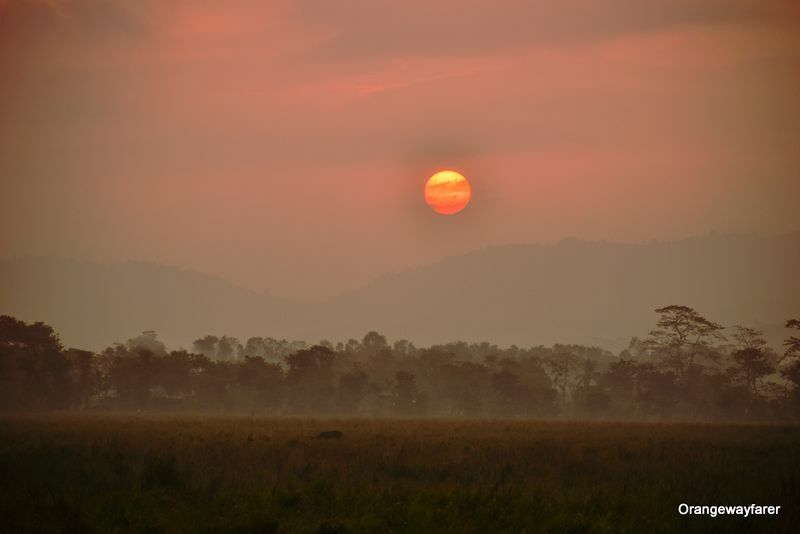 A spectacular Sunrise as viewed from Kohora, Central range at Kaziranga National Reserve Forest, Assam. 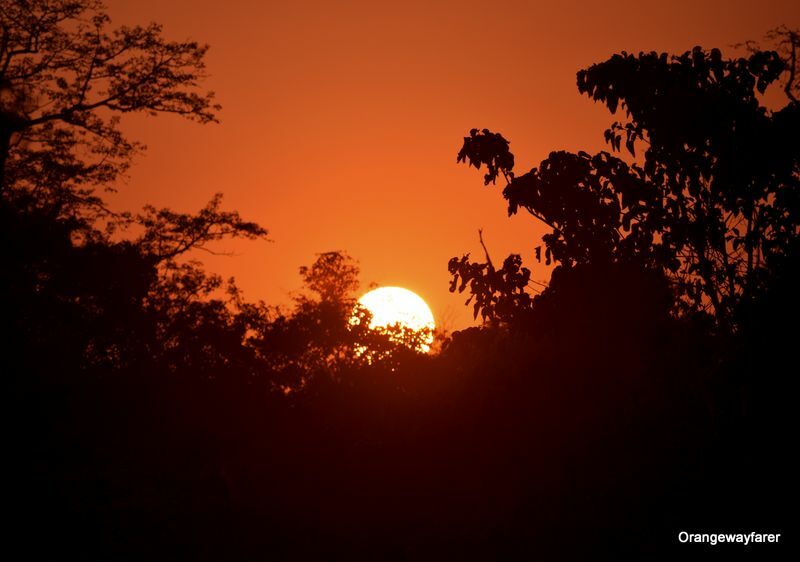 Also read: The great African Sunsets from Masai Mara! The car was running past vast Assamese plainland made of Brahmaputra’s alluvial labour of love. A remorseful sun had already set the elephant grassland on fire before bidding adieu. Looking at the tiny villages at the outskirts of Kaziranga rushing past with little huts and a weary mother making arrangements for a fire in the earthen oven, I suddenly scream, “Ota ki?” What is that? A prehistoric animal was slowly moving by the paddy field. It was solitary. It was calm. It pointed its unicorn horn straight towards the sky. It was one of the few remaining one-horned rhinos in the world. It stood for a while on the plough-field, looked around and walked again! The relentless noise of moving vehicles from the nearby highway seemed not to startle it. “Is that a rhino? Do they come out of the jungle like this? They do not hurt anyone?” My urban mind could not make peace with the fact a wild animal can roam freely in human habitat. Or is it really a human habitat? The first Darshan of Gandar Avatar! I lost count of the number of times I saw rhinos at Kaziranga after a couple of days! Do note teh electric wires at the background! From Hunting to Poaching to Land Encroachment, Homo Sapiens has been anything but KIND to the wild! The great Indian Rhino or the one-horned rhino, once thriving on a vast land at the foothills of Himalaya, from Pakistan to India’s Northeast have been rapidly hunted throughout imperial history, from Samudragupta to Md Babar till the reign of British. The elaborate hunting will be imprinted in coins, documented with praise to the king. Their horns will eventually be a dagger cover in the Middle East or get mixed in the drink of impotent Chinese men, yelling to reproduce. Shamanic practice will preach about an incessant energy flow from the bones these passive-aggressive large mammals (an Indian rhino weighs around 4000 pounds at an average and is 6 feet tall). Nutheads will be on the lookout to tame and make money out of these docile gentle beasts. underground market calls rhino horn as “Fire Horn” and trades them in gold. However various scientific journals have proved that the rhino horn is actually made of keratin, the same that human nails are made off. 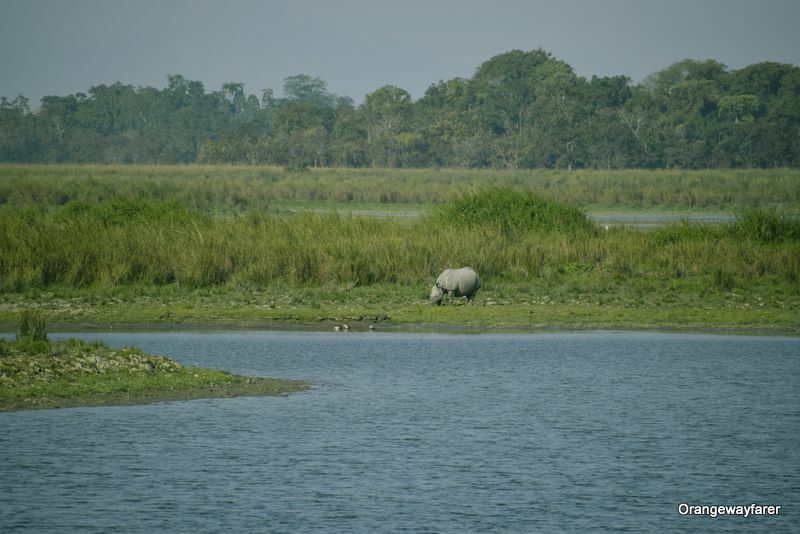 Even though Kaziranga has done a spectacular job at Rhino conservation, with two-thirds of world’s Rhino population being put at one place, the first encounter with the UNESCO heritage Site made me ask who is at the odds here? The poor rhino who had to come out of the “safe” boundary of the jungle to graze at an agricultural land, with a few domestic bovines by its side? Or is the tiny huts and their occupants at the fringe villages increasingly demanding forestland in order to feed self and the rest of the countrymen? When nature gives! A rhino, a buffalo and an elephant walk on the same ground… Animals do not kill unless they are hungry. Far away, where the horizon merges with the mighty river Bramhaputra, poaching and land encroachment are the threats looming large. The jungle is mystic and far spread but it does abruptly end after a while, with human habitats, colonial tea gardens springing up at the immediate border. Add t these, Brahmaputra knows not how to control his rage during monsoon and brings deadly flood every monsoon. 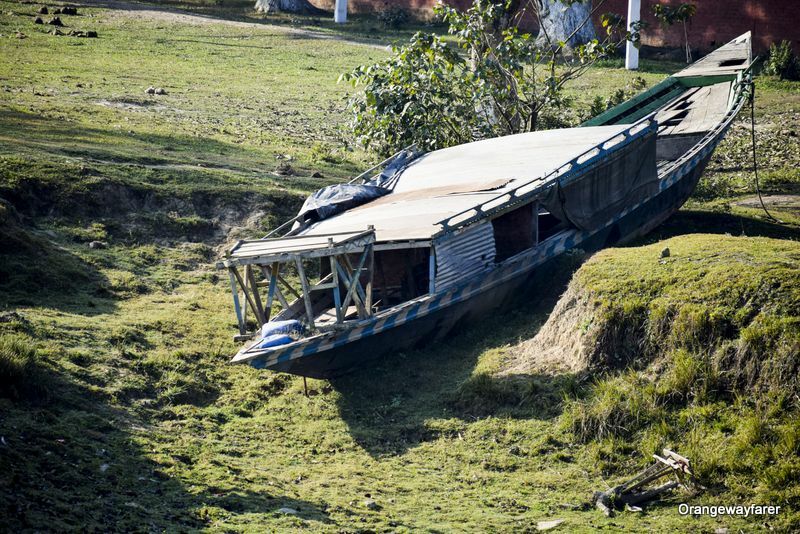 Heartbreaking media coverage of dead animals afloat follows as an aftermath. It is said, Lady Mary Curzon, wife of Lord Curzon of Kedleston (the then Viceroy of India from the early 20th century) was not able to spot a single Rhino and felt distressed after visiting the park. Her sadness triggered a quick initiative, a stepping stone, to make the Kaziranga forest a reserved one, and to save it from the ever-increasing grab of the tea gardeners. Rhinoceros Unicornis has reasons to be thankful to this one single lady from the Sapiens species. The jungle houses moonstruck lovers too… Kazi, a man from Karbi Anglong the village at the outskirt of the forest, fell for a girl named Ranga. Ranga is Red, literally, in love. Frowned upon by civil society, they went into the jungle. I hope their legacy lives in one tiny hut with a few children and a couple of pet dogs and cows and hens and ducks by Dhighali Beel. What is the romance in a wilderness heartland without a few legends and folklore? 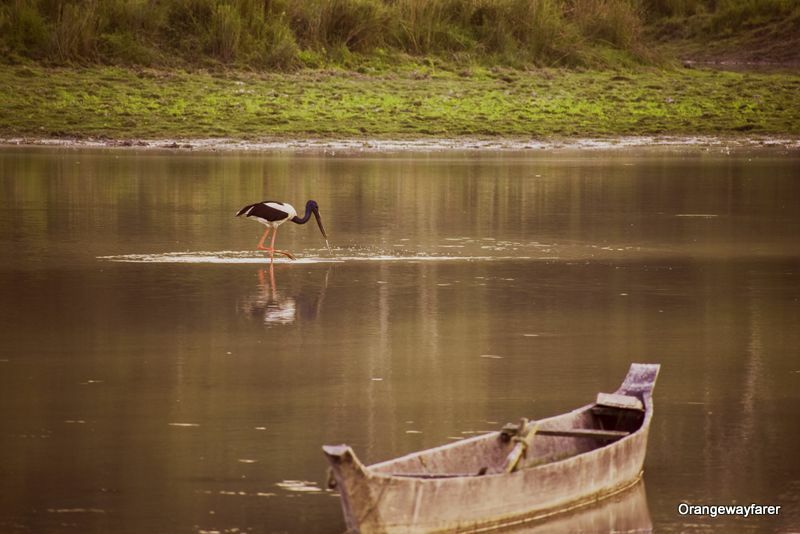 We were headed towards The IORA Resort, one of the more fashionable choices of accommodations at Kaziranga. Enroute, we stopped for a couple of times. Birds flocking back home and chirping in all excitement, a nonchalant Barashinga munching on grass gracefully, an over-enthusiast picnic group playing loud music and trying hard to get the animal’s attraction, crimson gold hues of the setting sun as if it makes fun of the superlative race; such drama, much wow! How to Reach Kaziranga National Park? Reaching Kaziranga using public transport is a cakewalk. the nearest airports are Guwahati (connected internationally with Southeast Asian countries) and Rowroya Airport at Jorhat, only at a distance of 100 KM. Do take one of the frequent buses of Assam State Transport and reach Kohora, the main market area of Kaziranga. these public buses are dirt cheap and can be availed from Guwahati ISBT. It takes 4 hours drive from Guwahati to reach The Kaziranga National Park. Furkating Junction (75 km) is a train station situated nearby, connected with a greater network of Indian railways. Helem (30 KM) and Jorhat (90 km) are other nearby railway stations. 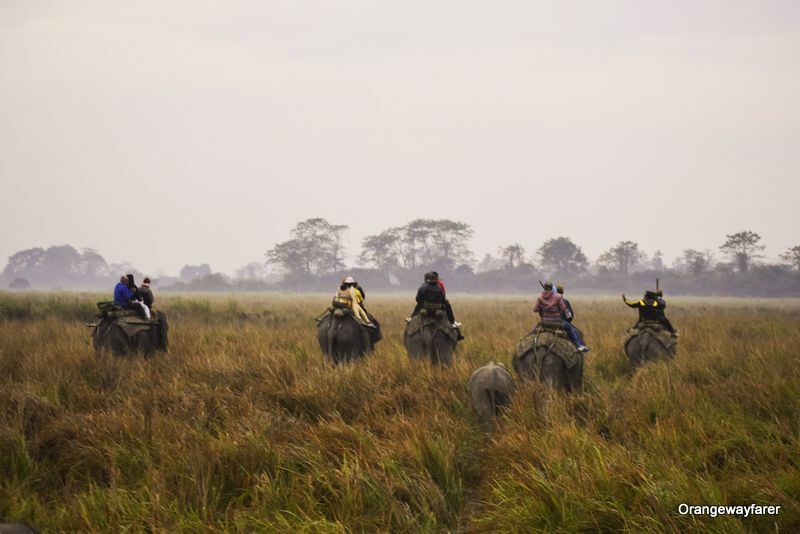 You have to take a bus or shared jeep to reach Kaziranga. Nights at Kaziranga are scary. They are pitch dark unless a full moon decides to show her face. An uneasy pregnant silence surrounds you. 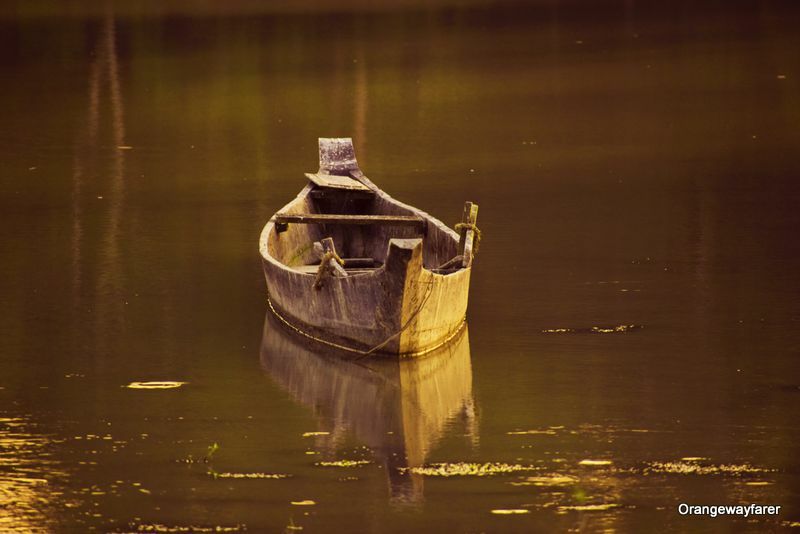 You know you are minuscule and lonely in this big bad world! And Helpless, that too! You are shown your place. Inside the resort, there is minimal chance of an animal encounter, unlike Masai Mara, Africa! I guess that is a good thing! But your human instincts urge you to go out, explore and see life in a jungle. We had rented a car for three days. We drove towards the main market, Kohora. It is where the ticket counter is. The ticket counter is your “Khul Ja Sim Sim” entry point for morning elephant ride! 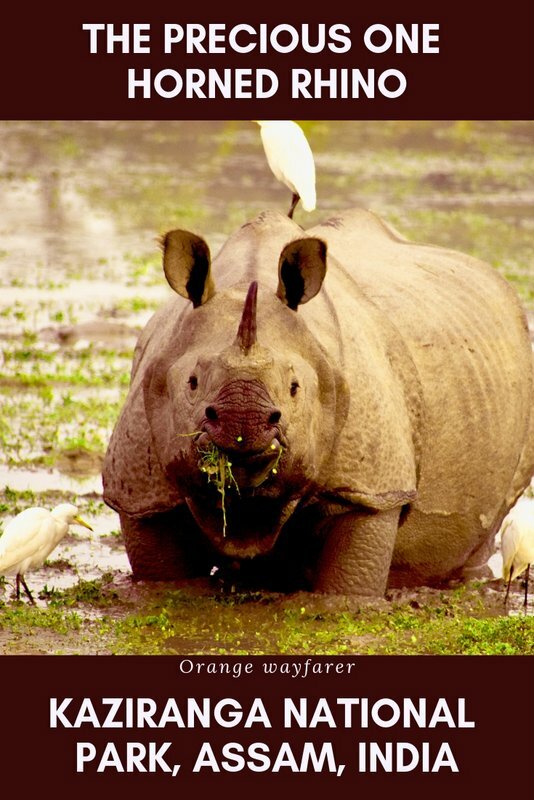 The Kaziranga National Park is humongous and generally divided into three regions for visitors. The Eastern Zone/Agartoli: The rugged eastern Zone is the quintessential birders’ paradise! The Western Zone/Bagori: More popular with domestic tourists. Private elephant safaris start from here. The Central Zone/Kohora: this one is my favourite part of the jungle. Very less number of tourists actually get tickets for Early morning elephant rides. And wildlife sighting is more frequent. Elephant rides are conducted only from Mihimukh gate, the central range and the western range. Jeep safari, on the other hand, is possible in all the ranges at stipulated entry time. The time to enter the park for a Jeep safari is till 10 am and 3 pm for morning and afternoon slot respectively. Ele mothers at government work at Kaziranga. the young one is a baby born captive, follows. Around 600 guards are on the field to protect the grassland. How to get a ticket for Elephant Safari at Kohora/Central range? Central range of Kaziranga National Park only lets Government employed forest guards run elephant safaris. There are 4 to 5 elephants at one go. Each of them carries 2 tourists and a Mahout. The ticket number is limited and foreigners are preferred. The first 15 tickets are reserved for the foreigners. The rest 5 or 6 are given to Indian nationals. These numbers are not fixed and may increase or decrease depending on the number of elephants on duty! The ticket counter is open from 6:30 PM to 7:30 PM. After 7:30 PM the tickets are given first come and first serve basis, irrespective of the nationality. Elephant ride Fee is 900 for Indians and 1950 for foreigners. If you are carrying a camera, you pay 100 bucks extra as an Indian or 200 as a foreigner. Always carry an address proof as ID card. We queued up behind a couple of Indian tourists. It was a cakewalk to get those tickets since it was middle of the week and distant from a typical holiday season. Otherwise, good luck getting elephant safari tickets from central range! The elephant ride at the Western range is more commercialised. Elephants are privately owned. They carry 6 visitors beside the Mahout. The walking range is shorter. A lot of elephants (at least 10) enter the forest at the same time. In short, I would say your money is better put in a jeep safari instead of elephant ride at Western range. You can easily access the elphant safari from western range. For us, just a call at the hotel reception did the job. I told you, it is very touristy. I regretted taking this ride. But that story will wait for later. A nearby auditorium also had local artists performing. A local group performed Bihu dance. 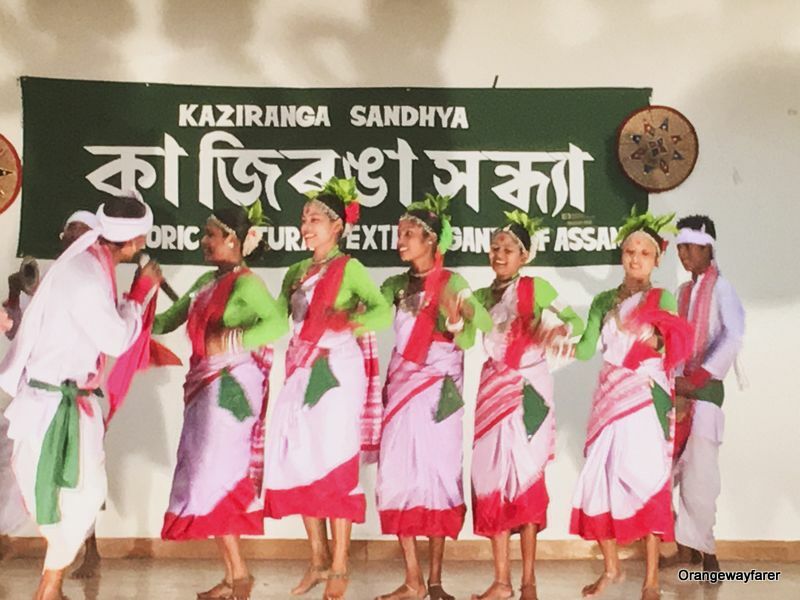 You need to witness a Bihu performance to grasp the charisma of the art form! The grooving energy, the catchy tune, the women in Mekhala transforming into birds, Bihu is beautiful beyond words. It was followed by a dance by the tea planters. Kaziranga reserve was able to save its precious marshland from dangerously progressing tea plantation line. However, they surround the jungle. Tea plantation in India predates the insta-worthy pics of beautiful lush green mountain steppes and is long associated with labour exploits. Most of it is migrant skilled labour that the British brought in from other provinces. Uprooted from original culture, the tea plantation labourers gradually crafted their own form of art and music. Listen to the lyrics carefully and you will hear mentions of a master and his brutal deeds. Buy a Kaziranga saree from Kaziranga and thank me later! Kohora has a small market area. A few local stalls sell a hot cup of tea. Freshly fried samosa looks up from a tray nearby. The stalls at the corner showcase beautiful Assamese textiles. It is one of those stalls I was casually checking out when I found my most endearing Saree in the closet, a Kaziranga Saree. It was woven on handloom cotton. It has Rhinos and elephants woven in warm rustic red hue queue up on the border. It was a dream saree, a piece of art, hand woven with love from one of the nearby villages! Kohora market area is incredibly calm and quite at night. However, I managed to find a few eating joints for decent dinner experience and gonna list them below. Ask for the famous local rice beer, Apong. I also loved the bamboo shoot and pork khorikas (local style of grilled meat). 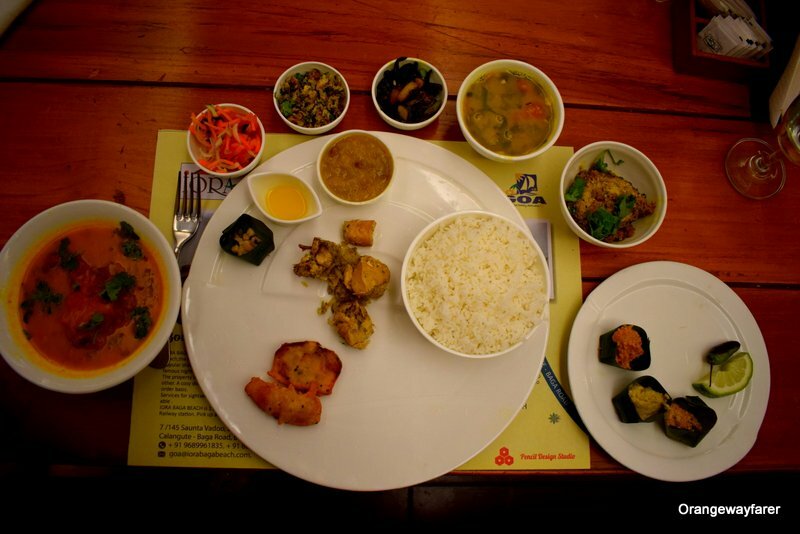 Also read: An affair on the North east Road-trip with Assamese Thali! 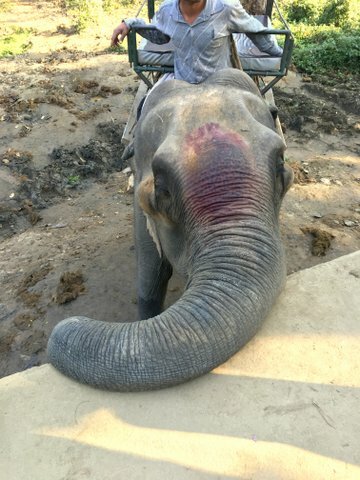 Elephant rides start at the wee hours of the day. We had to be present at the gate by 5 am! we called it a day, early. However, you can roam around a little after safari and buy the pretty souveniers. The hornbills with profound beaks and one horned rhinos immortalised in choice of wood. 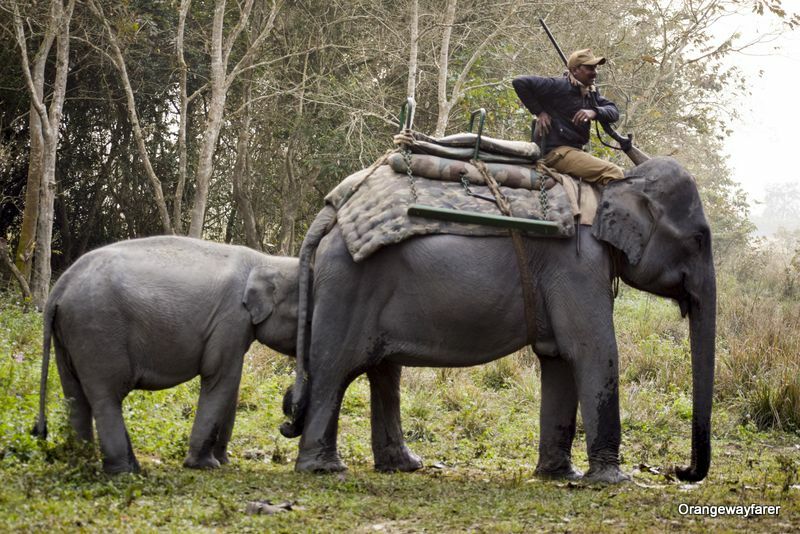 The Curious Case of Elephant Ride in North East Indian Jungle Safaris! Domesticated elephants are a part of the rural lifestyle in Northeast India. The animals were used for hard labour in logging and tea planting industry even a few decades back due to dangerous terrain and absence of infrastructure. Now that roads are bringing in the outer world to the remote corners of North East India and machine alternates have replaced them from “work” the domesticated elephants, mostly female ones, were traded to villagers associated with tourism business. 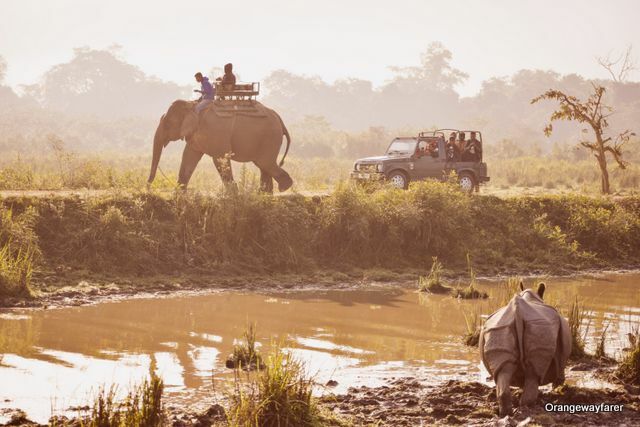 Elephant safari is a big attraction to Kaziranga’s visitors which helps bring the money flow. 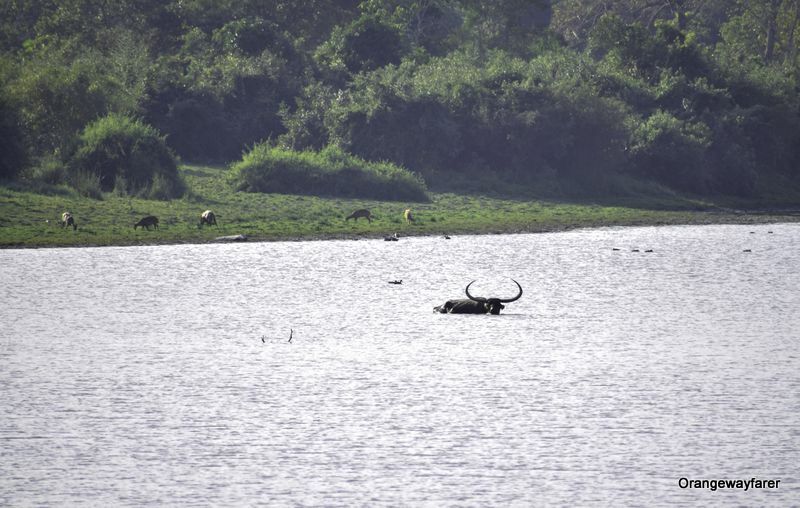 Local community benefits from tourism and poachers are kept at bay. It is a strange relationship. In one hand, they are named after Bollywood characters, treated as a member of the family, sent off to the wild to romance (to mate and come back to deliver a baby hopefully), buried with reverence. However, that does not do away with the frequent sticking on the head. And that is brutal, period. The elephants also contribute majorly in conservation efforts in the wild! “We do not bring new ones from the jungle but we make do with what we have. We have enough elephants in reserve.” said one of the forest guards. Sure they have a lot. They also have the offsprings by side. But these animals can penetrate into the hinterland of Kaziranga’s wild plains, where wildlife roams free, knowing little of the poachers lurking behind bushes. The parts of forest which are off-limits to tourists or visitors but vulnerable as a battlefield of animal organ trade. It is a cakewalk for an elephant to walk into those dangerous zones, with forest guards mounted on its head, fighting off human greed. Our elephant, Lokkhi, was a mother of a playful little Ele. It followed us all along, playing with straws picking up from the road, occasionally nudging another calf, pretty happy with the morning walk! It was before Sunrise. 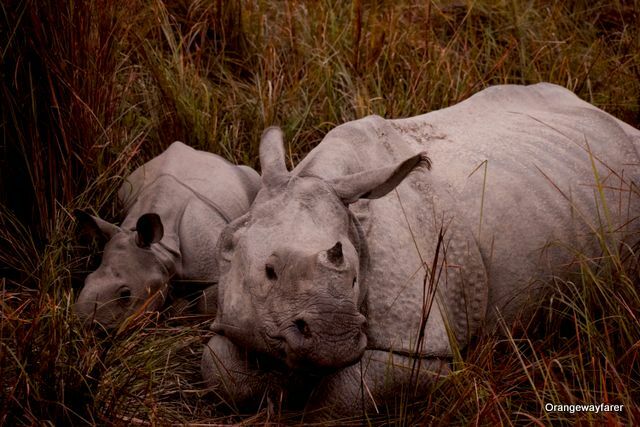 We spotted a mother rhino guarding her sleeping child. 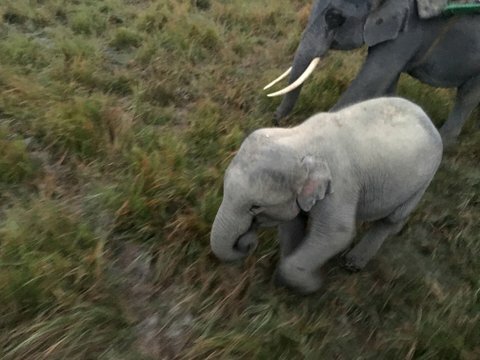 It did not move a bit even when 5 giant elephants surrounded her and the baby. Wanna join me for breakfast? Morning unfolds peacefully, with sunrays glistening smoothly on the tall elephant grass, a perfect camouflage for the predator of the land, the Tigers. Kaziranga is also a Tiger reserve, with the number of the predator crossing a century. 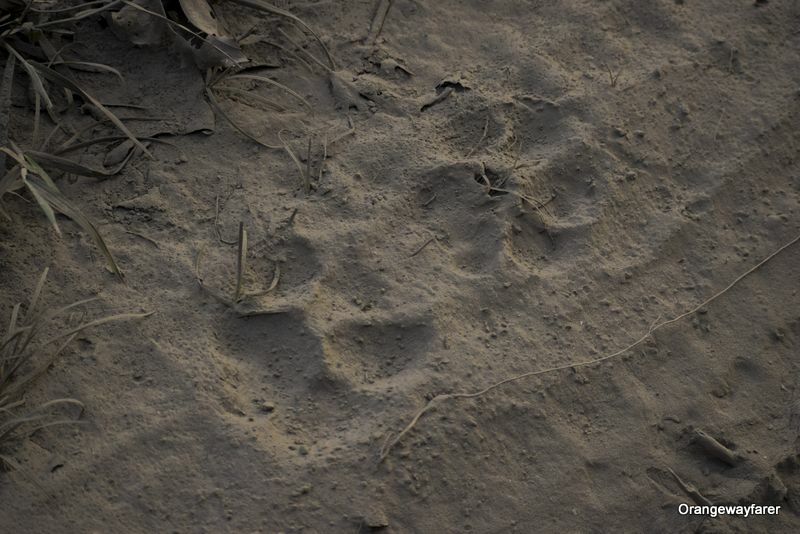 The big cat is pretty elusive, making sudden appearances often compared with fiery flashes. Also read, 6 reasons why North East India is nothing like you have ever seen! A control burning of elephant grass takes place in February. You have a better chance of spotting a tiger then, I learnt. You ask me if I want to see one? I am not sure. I have already seen the youtube video of a tiger jumping at a tourist sitting on an elephant, right at Kaziranga. I shall pass! I am a naysayer! A swamp deer, Barashinga. A female one. The elephant Lokkhi seemed happy to collect her breakfast en route, eating shrubs, stepping onto uneven lands, walking past inquisitive swamp deers, a lot of nonchalant rhinos. An elephant from the wild was standing at a distance. Will she near him? I ask! The guard chuckles. She will run if he charges. Domestic elephants are scared of their wild counterparts. This fear often keeps them from being repatriated into the wild kingdom. It is strange to sit on an elephant, its furs strong as a stick, poking through the skin, its warm body making its presence felt, its muscle movement constantly reminding you of your tiny existence in comparison to the huge animal. It moves gently, taking time to lean from one side to other, we call it Dulki Chal. You are sitting on a swing! Elephants at the Western range are more like exploited employees. Overworked and less paid! These are privately owned and carry 7 people on their shoulder at one go. Our safari ended as the Sun shined bright from the sky. The elephants have double shift in the morning and then they rest for the day unless a situation occurs demanding guards rushing to proceed towards the interior of the jungle. Sleep baby, sleep. Spotted him peacefully sleeping on our way back! Such heart-melts! 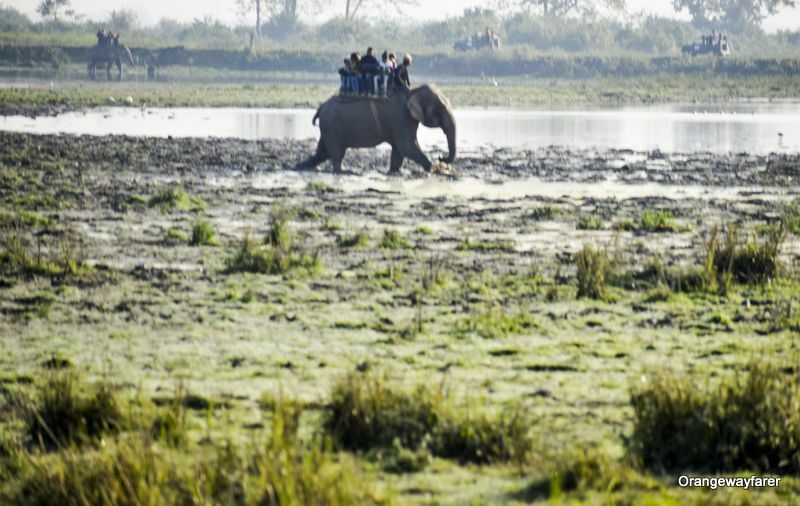 Walking inside Kaziranga is prohibited and may cause serious trouble. Guards are fighting a lethal battle against poachers. The jungle has no mercy. Kaziranga has a few made up road crisscrossing the watchtowers. The rest is a medley of marshland, river systems, beels (lakes), plane grounds, dense lush vegetation. Elephants walk for only a few KMs. Jeep safari will help you get into the real interiors of the forest within a small amount of time. Jeeps will make you rush through the jungle. Is it worth it? A resounding yes. I waited for a few hours impatiently before the afternoon jeep safari started. It starts at 2 pm. A nearby Orchid Park maintained by the villagers attracts people meanwhile. Unlike Safaris at Masaimara in Africa, you cannot drive in Kaziranga for the entire day. There are designated time slots for entry and exit during morning and afternoon which you have to stick to. Jeep safari also comes with additional charges like entry fee, camera fee, welfare fees and toll fee. For Central range, we paid around INR 2500 all-inclusive. It will be Around INR 5000 for a foreigner. With the mighty speed of jeeps come the obvious vice of a tire scratch sound. Add to that over enthusiast tourist groups, constantly making remarks. Tigers will swear not to face us, I think in my mind! Do not wear flashy dresses. The bright red may attract BaghMama for all the wrong signals. Do not ever make “catcalls” to animals, be it elephants or rhinos. A charging animal can actually damage the car. Maintain silence and hear the tunes of the jungle for a change. Do not leave behind anything. Your water bottles made of plastic is a nuisance to the jungle. Get down from the vehicle only when instructed. otherwise, NO. You will likely be climbing a few watchtowers overlooking shallow beels (lake), water reserves where animals come to drink. not knowing of any weakness. 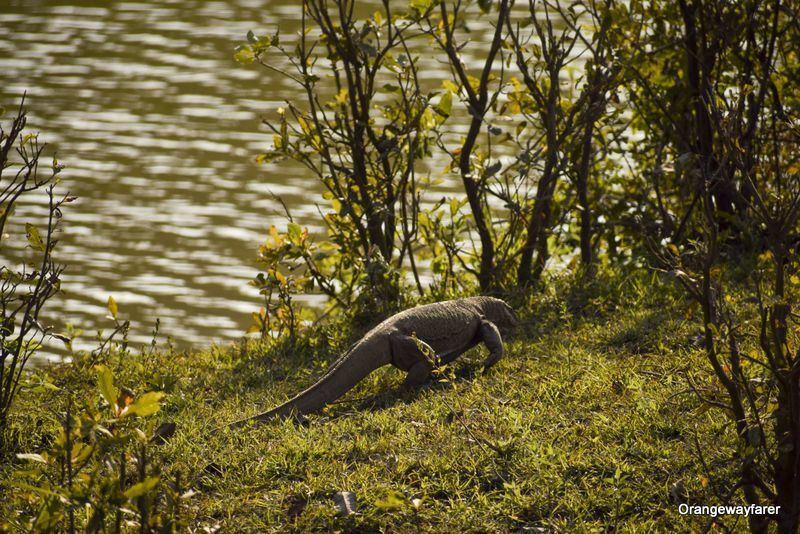 A water monitor walks by a water stream at Kaziranga. We waited here for at least 40 minutes. The guard heard what he describes at “tiger call”. But no luck! Not yet! Of course he decided to walk past us from back! and left his pug marks. 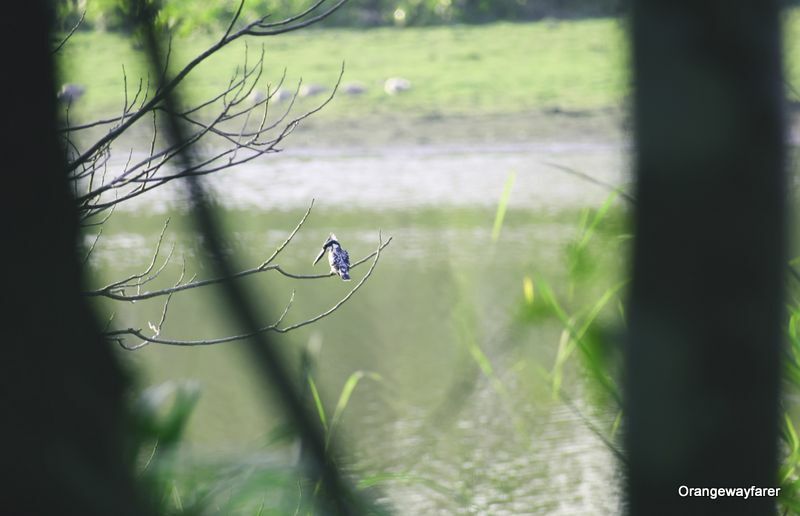 Meanwhile I was busy shooting this beautiful blue Kingfisher bird! The jeep safari lasted till sunset. As usual, it is pitch black. The speeding jeep leaves behind carcasses of huge trees. Eerie sounds emerge from the surrounding. I huff and puff to reach back to the entry gate, the deem light of electric civilization assures me of safety! 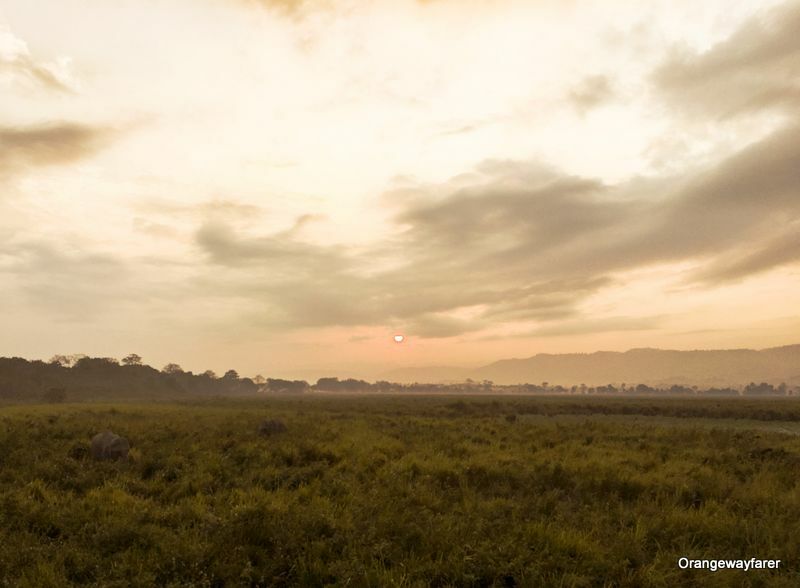 The eastern range of Kaziranga is rightly called a birder’s paradise. End of the monsoon season, Brahmaputra recedes but leaves behind many traces of the fierce force of water. Shallow lakes, water channels, marshland dot the landscape, making it a refuge to migratory bird species. 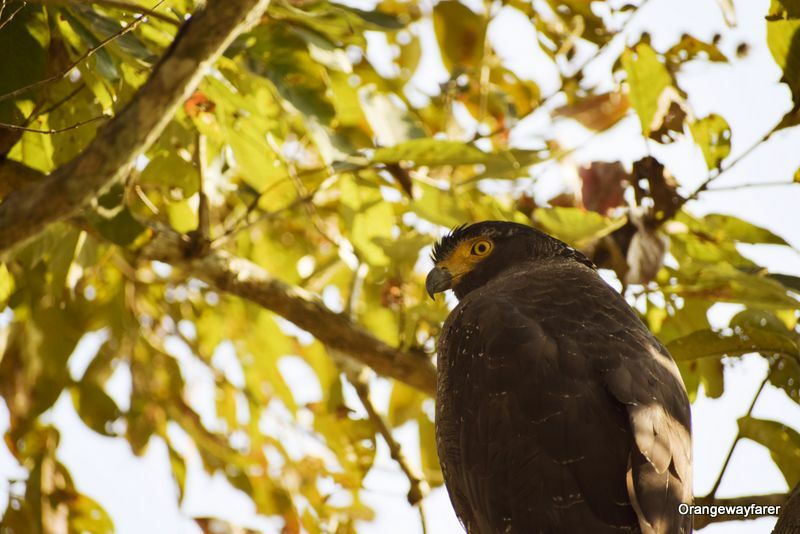 A recent survey concluded more than 80 species of birds call eastern range home. The most frequently seen birds are Bar-headed Geese, Gadwalls, lesser whistling ducks, common teals, northern pintails, Indian spot-billed ducks, greylag geese, Eurasian wigeons, mallards, ruddy shelducks, common pochards, northern shovelers, ferruginous ducks, and Chinese Spot-billed ducks. It is safe to say this birder’s paradise does not attract the larger lot of tourist crowd. The eastern range, thus, is more wild, serene and scenic. I had heard from a few guards, your chances of spotting a tiger are higher at Eastern range. 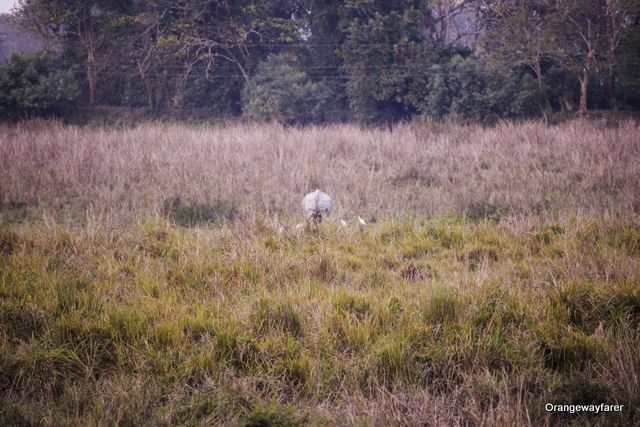 the big cats of Kaziranga are rather camera shy. Also read: Dandeli, A forgotten jungle where birds roam free! Kaziranga’s northern border is outlined by the mighty monstrous river Bramhaputra. It is where you can take a chance at spotting the blind Gangetic River Dolphins. The lower the level of water, the better luck you have. 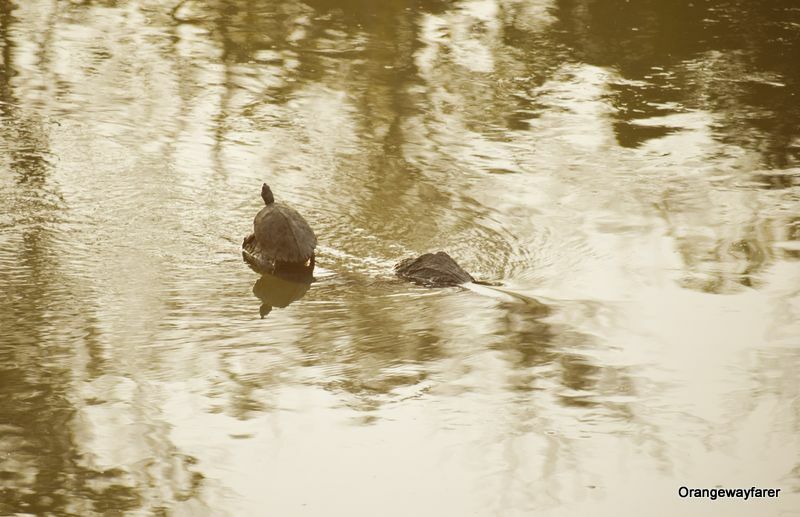 A lingering look at the deep murky water is adviced to spot these rare blind mammals bobbing up. They emit ultrasonic waves that bounce back from surrounding environments to allow the animal to create “images”, basis on which it “acts”(read prey). You get the tickets for boat safari from the same counter that sells tickets for jeep safari. 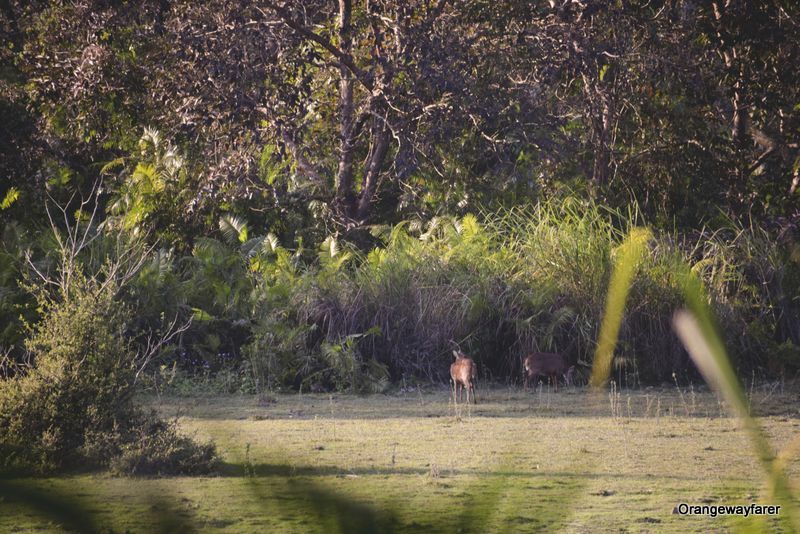 Kaziranga Reserve forest is officially open to visitors from 1st November to 30th April. Summer is particularly Hot and humid. I prefer dry winter months. 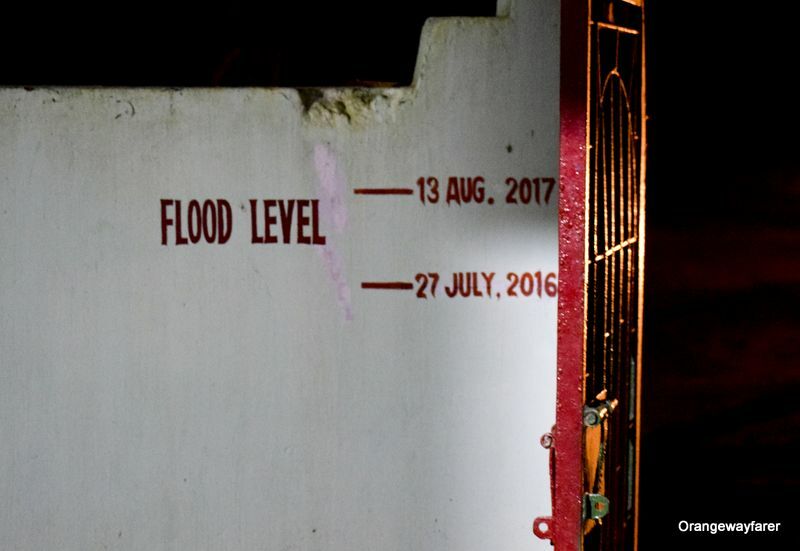 Heavy downfall or lingering flood situation of Bramhaputra river may affect these dates. Do check weather forecast before zeroing on a date. A couple of days stay is ample time to spot the animals. 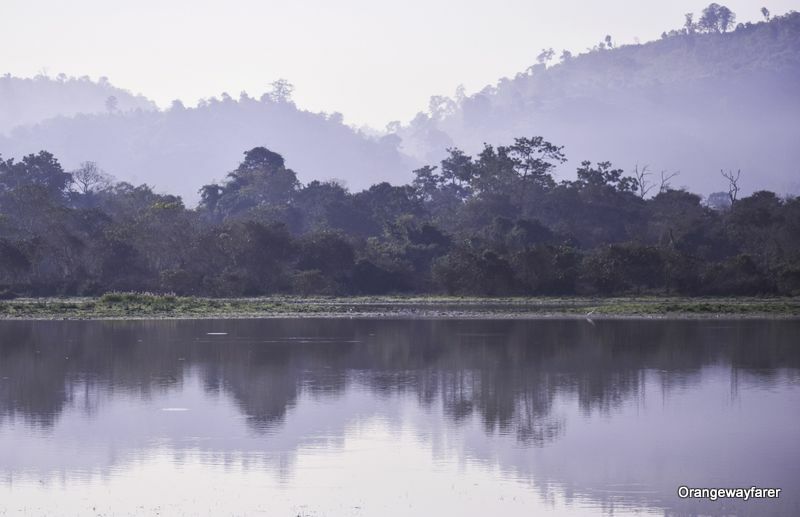 May to October is the notorious months of monsoon when Bramhaputra scours through the national park, driving the residents of the garden of Eden to nearby Karbi Anlong Mountains. Poachers are most active during this time. Many wildlife dies in the force of the water, out of hunger. Monsoon is trying time at Kaziranga national park. End of monsoon also gives volume to Kaipholangso Waterfall, making it a beautiful natural site to visit near Kaziranga. the largest riverine island in the world , on river Bramhaputa. I suggest keep a day for Majuli, it is worth it! On your way back you may also check out Nameri National Park and Manas National Park (another world UNESCO site). Really interesting that there are one horned Rhinos is India. I had no idea. I do wish they wouldn’t use elephants. Those elephants with 7 people on them…how horrible!!! one-horned rhino is only available in India and Nepal and they are endangered for many reasons. Elephants, yes but they contribute to larger good at the protection of the park.